Discussion in 'Studio' started by recycle, Apr 25, 2018. 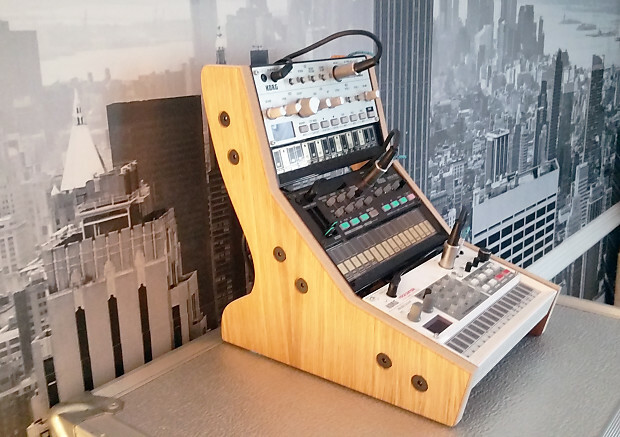 They build stands for every kind of synth / sequencer / drum machines / audio hardware. The wooden end cheeks that they sell are ony for esthetic reasons, the stands instead, have a functional purpose also and, in my opinion, it is an elegant way to solve the problem of a messy audio setup. They use quality fibreboard and the cut is just perfect. congratulations! it looks really sweet! i came across thier site sometime ago and was really impressed about what they are offering. How long did you have to wait untill you got your unit ? @recycle Thanks for posting thiis. I've been looking for this like forever.